Since picking up a really nice Pentacon Six for $150, I discovered that lenses for it cost about $300 apiece on the used market, which for me is a little dear. Here's a working sketch of the adapter, machined from 3/8" aluminum stock. If you don't have a lathe at home, it shouldn't be too big of a job for a machinist friend or a local machine shop. 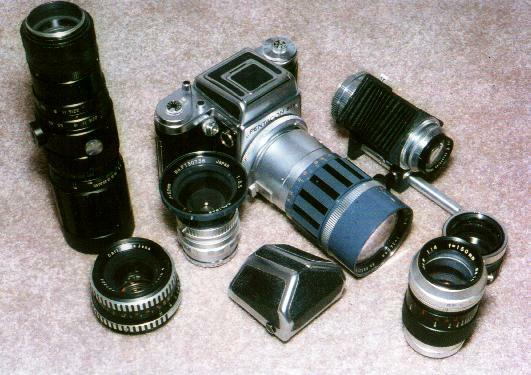 At the top, the adapter in the Pentacon body; below, the adapter on a 52mm Kalimar wide angle lens; and at the bottom, the whole thing together. The Kalimar camera is to the left. T-Mount and Teleconverter to fit this adapter!